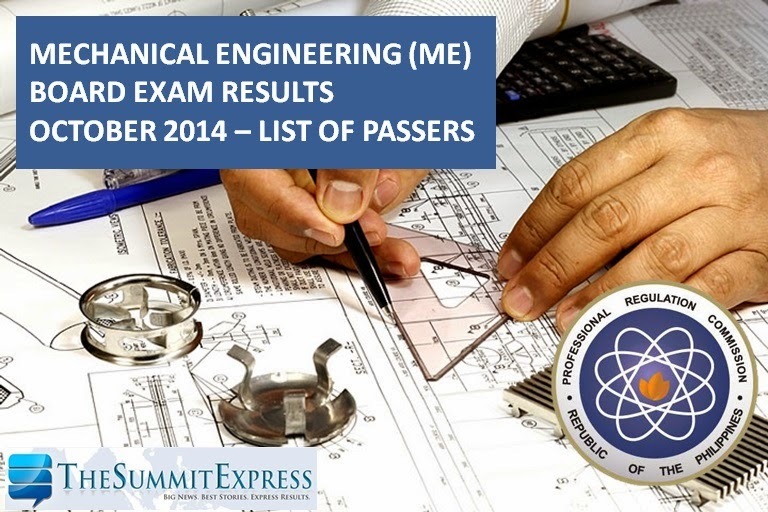 October 2014 Mechanical Engineering (ME) and Certified Plant Mechanic (CPM) board exam results are available here as officially released online. Results are out d in 2 working days from the last day of exam. PRC and the Board of Mechanical Engineering announced complete list of passers, top 10, top performing and performance of schools. PRC on Friday said that 2,960 out of 3,841 passed the Mechanical Engineer Licensure Examination and 32 out of 59 passed the Certified Plant Mechanic Licensure Examination. ME and CPM board exam were administered in the cities of Manila, Cebu, Davao, Iloilo and Lucena on Tuesday and Wednesday, October 7-8, 2014. The members of the Board of Mechanical Engineering who gave the exams are Engr. Leandro A. Conti, Chairman and Engr. Vicente B. Vosotros, Member. Malolos (BSU) graduate topped the board with 96.20 percent average grade. Batangas State University (BatSU) - Batangas City (PBMIT) was named as rank 1 top performing school. Aside from the availability of results, registration schedule for the issuance of Professional Identification Card (ID) and Certificate of Registration will be announced. Those who will register are required to bring the following: duly accomplished Oath Form or Panunumpa ng Propesyonal, current Community Tax Certificate (cedula), 1 piece passport size picture (colored with white background and complete nametag), 2 sets of metered documentary stamps and 1 short brown envelope with name and profession and to pay the Initial Registration Fee of P600 and Annual Registration Fee.